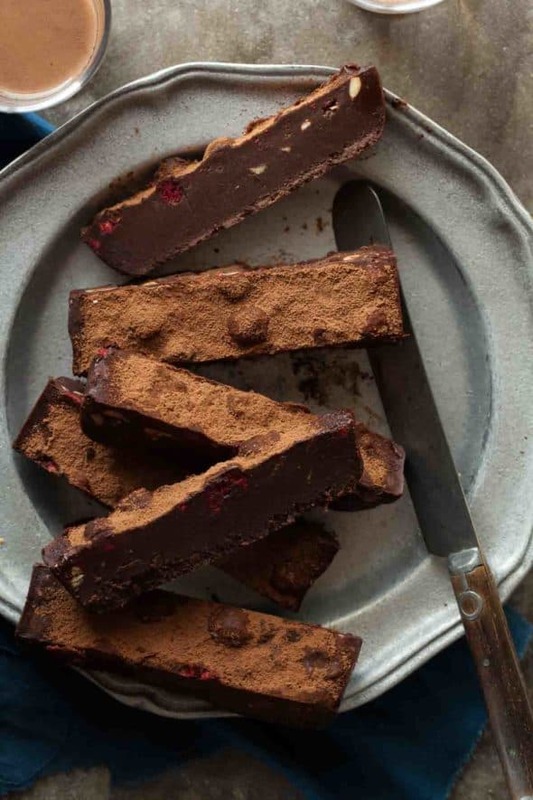 A fudgy no-bake chocolate truffle cake with raspberries and almonds that sets in the fridge and only takes minutes to make. Everyone needs a fuss-free, no-bake dessert up their sleeve, and if chocolate is involved well all the better right? This is how I assume chocolate fridge cake became so popular over the years. 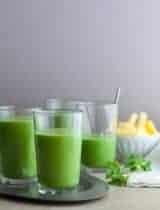 Spend ten minutes or so melting, stirring and pouring, and a short stint in the fridge takes care of the rest. In fact, the longer it stays in the fridge the better it tastes as the flavors mingle and meld together. More like fudge than a proper cake, it’s the sort of thing I like to throw together at the last minute when I’m in the mood for a special after dinner treat or if I need an easy make-ahead dessert to bring to a get-together with friends. 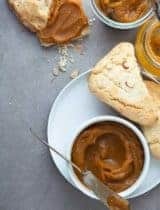 As the name implies, there’s no baking involved; it’s a one-bowl kind of dessert that’s made for busy days and last minute chocolate cravings. 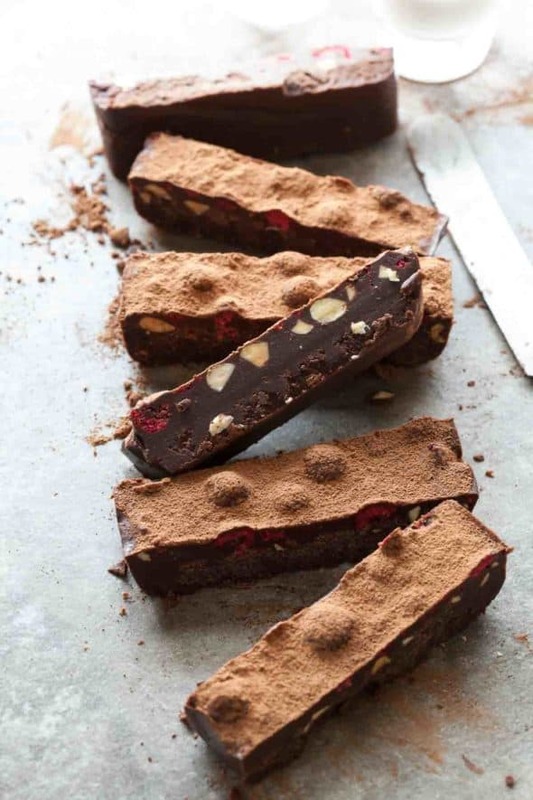 I’ve taken some liberties and updated the traditional recipe to make one that’s entirely raw and filled with good-for-you ingredients like coconut oil, coconut butter, cacao powder, cacao nibs, raspberries and almonds. Dark and decadent, a small slice goes a long way. 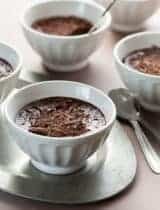 Most of us have heard by now that dark chocolate is really rather good for us since it’s a source of much needed magnesium, anti-oxidants and other beneficial compounds (not to mention a powerful mood improver) so you hardly need an excuse to make this. It’s delicious eaten chilled straight from the fridge or, if you have more patience than I do, even better five or ten minutes later as its fudgy consistency turns positively silky. Did I mention how easy it is? Right, so what are you waiting for? Line a loaf pan with parchement paper, set aside. Set the coconut oil and coconut butter in a medium bowl placed into a larger one filled a quarter of the way up with hot water. Stir until both are fully liquid and melted. Whisk in the sifted cacao powder until smooth and well incorporated. Whisk in the maple syrup and a pinch of salt until fully combined. 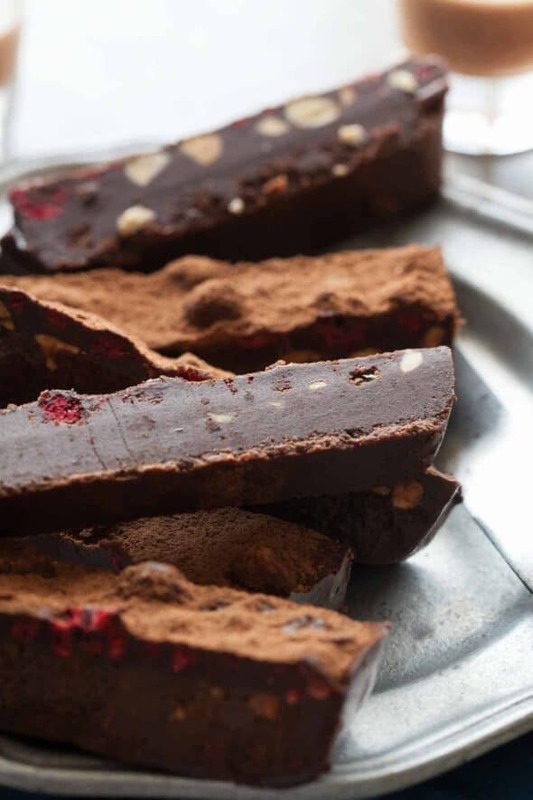 Mix in the freeze dried raspberries, chopped almonds and cacao nibs. Pour into parchment-lined loaf pan. Let set up in the fridge for at least 1 hour. Cut into desired sized pieces and dust with additional cacao powder before serving. Sylvie this is awesome! 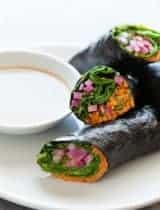 Love that it's do bold and dark and nobake! pinned And maybe my eyes are playing tricks on me, but did you just do a major site overhaul & makeover? Your site looks great! This cake looks like such a nice snack! So delicious! Wow, that does look and sound truly decadent, I can imagine how rich and filling it would be. Yum! Love how easy this sounds Sylvie! I've seen freeze-dried fruits at Trader Joe's and always wondered what else I could do with them besides nibble on them as a snack. Mmm - this would be a great dessert for a crowd. I love the texture in the pieces that the dried fruit / nuts give it! 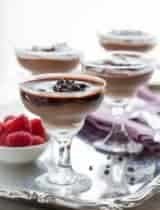 This is exactly the sort of recipe I need when the chocolate cravings hit! I already pinned it! That gorgeous, chocolate-y sheen is calling my name. I love everything about this recipe. This sounds amazing! No-bake and so chocolatey! Love it! Yes please to chocolate and no-bake! Gorgeous! I just hit my screen. Yum. I would like a bite of that! Perfect for a quick Valentine's Day dessert. Beautiful Sylvie! Wow, now this sounds exquisite! 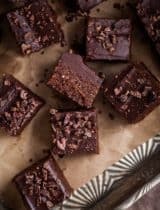 Healthy chocolate refrigerator cake = Yes please. oh YOU!! can this be any more appealing ? question though...can you share your best advice on dehydrating our almonds please? I like to soak mine in a large glass jar filled with filtered water and a pinch of salt for at least 12 hours and then I rinse and pat them dry with a paper towel. If you'd like you can easily remove the skins at this point but that's up to personal preference. If you have a dehydrator you can use that to dry out the soaked almonds otherwise you'd dry them out on the lowest setting of your oven (around 200 is the lowest for most). The drying process can take anywhere from a few hours in the oven to 12 hours in the dehydrator so keep checking on them and remove them when the are completely dry throughout. Hope that helps! Looks absolutely decadent, nice job! Oh my, you've done it again. What a beautiful, health-filled treat. I can't wait to pin these, to make these, and to share these with my friends! Wow! 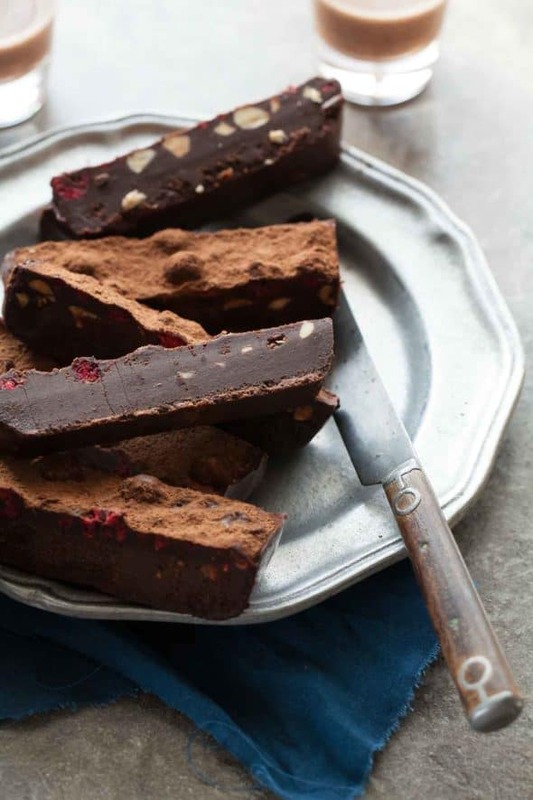 Fudge, panforte, chocolate salami... but yours is just beautiful. I usually don't go for these kinds of treats but boy is this one magnificent... and I would definitely try a slice. With crème anglaise? Wonderful and elegant. I've found them at both Trader Joe's and Whole Foods. this cake looks perfect. i'd have a hard time with self-control if i was left alone with it. also... your site looks awesome! maybe i'm late to notice, but the make-over is lovely! Not late at all, I just changed it! Oh yeah, straight from the fridge sounds perfect! I love this. I have this huge tub of cacao butter that I use for personal care products, but I keep thinking about doing something like this with it. I should start with this. Fuss-free is one of my favorite kinds of desserts... and I agree that everyone needs to have one. This sure does look fabulous and totally decadent. Also, my mom's best friend is gluten-free and vegan, so I'm definitely passing this along. Hi Shel, thanks for catching that! 60g is the correct measurement as I test all my recipes by weight for the most accuracy and then make the necessary conversions. It's actually about 1/2 cup and I've gone back and corrected it. I just love the texture, the first image is breath taking…i only wish my screen was a window and I could just reach out for one. Love your space! No not at all, you can substitute more nuts or other dried fruit for the freeze dried berries if you'd like or just leave them out altogether. I noticed that there are lot of cocoa powder in the cake, will it not make the outcome taste a bit bitter? It's nice to know that we can eat healthy cake without baking it. 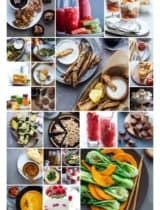 Your blog covered a lot of nutritious recipes. Hi Alex, It's a dark chocolate taste similar to a rich chocolate fudge or frosting but not bitter by any means. A reader also caught a mistake in the amount of cocoa powder listed previously, it should read 1/2 cup and has been updated now to reflect the correct measurements. LOVE the use of freeze dried raspberries. Yummy! That is a lovely, lovely recipe! 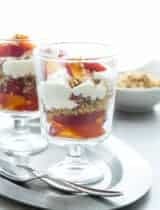 I adore those freeze dried fruits and they are perfect in a recipe like this! Thanks so much Nami, I'm glad you like it! Sylvie, this is so beautiful and decadent! I love the wonderful quality ingredients you've used. I'm pinning now to make for my husband for Valentine's Day! I cannot wait! This looks fabulous! Unfortunately I'm allergic to coconut... Any suggestions for substitutions for the coconut oil and coconut butter? Jen, the traditional recipe often uses butter but I wouldn't replace all the coconut oil and butter here. Instead I'd suggest making a ganache with heavy cream or coconut milk and whisking in the cocoa powder. Unfortunately I can't say what the measurements would be in order for that to set up properly as I haven't tested it. Everything about this sounds absolutely amazing. Chocolate in its purest form, how can it get better than that? Sylvie, this is just plain brilliance! I love everything about this recipe and cannot wit to make it. Thanks so much for sharing. So, because this is paleo, technically it's good for me. Right? PERFECT!!! Pinned (from the Paleo Group). LOVE this. Making for sure. Hi Rita, The coconut butter really gives it that fudgy texture so I'd recommend seeking some out if you can. I find mine at Whole Foods pretty easily or order online at Amazon. Otherwise I'd say you could try replacing it with more coconut oil or butter instead. As for the bacon syrup, I say go for it! I'd use the same measurements unless it's significantly sweeter or less sweet than regular maple syrup. If I can't find coconut butter, is there a substitution? The coconut butter really gives the cake it's fudgy texture so I'd recommend seeking it out if at all possible. I've had luck finding it at Whole Foods or other natural foods stores near me or ordering it on Amazon. That being said you could try replacing it with coconut oil but it will change the consistency some. This looks great! I am cutting down on my carbs right now... can you suggest a low carb alternative to the maple used? Thanks! Wonderful, I'm glad to hear that! Can you omit the nuts from this recipe? Thanks so much! Absolutely, you can replace the nuts with seeds or dried fruit or simply leave them out. Thank you, I'm very glad to hear you like it! Hi Sylvie! They look gorgeous!! Gonna make them very soon.... maybe even today :) A question, how long can you store them? And do you need to store them in the fridge or it it possible to store them on room temperature? Thans in advance! Hi Lisa, You should store it in the fridge where it should stay good for at least a week. Hope that helps! Oh my.... I made this recipe with a good amount of freshly grated ginger. Oh so hard-to-give-away-delicious!!!! Hi there, I attempted your recipe last night, leaving it to set overnight. When I looked at it this morning, the mixture had separated with a hard, pale yellow substance on top (I assume to be the butter/oil) and the fudge on the bottom, I was just wondering if you had any idea as to what had caused this? The changes I made to your recipe was sultanas and chopped almonds instead of the berries and roasted whole almonds, regular cocoa powder instead of cacao and Vitalite butter instead of coconut butter. For what its worth, the fudge mixture on the bottom tastes delicious! HI Steven, It's probably the Vitalite butter, you really need coconut butter here for the right taste and texture. All the other substitutions are fine and shouldn't have changed the final outcome. Made this subbing freeze dried strawberries for the raspberries. OMG, this was amazing, even my dessert hating husband said it was the best dessert he has ever had!! Sadly this meant no leftovers!